Jack Clifford was born on a minstrel show on November 26, 1918, in Swainsboro, Georgia. His father owned Clifford’s Carolina Minstrels. Later his father had a booth called the Grease Store where he sold hotdogs and hamburgers in the Tom Mix Circus, the Hildebrand Circus and various state fairs and rodeos. John handled the soda pop and beer concession for his father. John’s dad also had a stable of prize fighters, so John started at one time to be a fighter. However, before he got going he had a double hernia and the doctors told him to lay off for a year. John decided to leave carnival life when his father and brother realized the old days were coming to an end and leased out their carnival. Relocating in California, John started working labor at the movie studios. Falling in love with aviation, he learned to fly and got a commercial instructor’s license. With very little money he bought out a small company and ended up with five airplanes, fully intending to go into the flight instruction business. His timing couldn’t have been worse. Within a few weeks it was December 7, 1941, and all private planes were grounded. John joined the service and spent his time “flying the hump”—the Himalayas. Coming out of the service a Captain, he wanted to fly commercial airlines but was not qualified due to no college degree—even with all his experience. 1949. John decided to get an agent and try for a career in the movies. 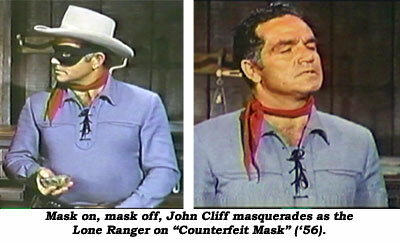 Luckily, he signed with a respected agent, Mitch Hamilburg, and his perennial scowl found work on “The Lone Ranger”, “Range Rider”, “Rin Tin Tin”, “Cisco Kid”, “My Friend Flicka” and other TVers right away—naturally, as a heavy. 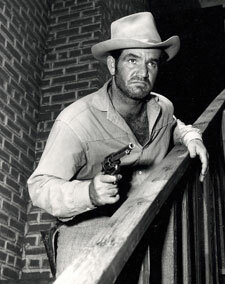 John also was cast in small roles with “Abbott and Costello In the Foreign Legion” (‘50), Gene Autry’s “Beyond the Purple Hills” (‘50) among others. In 1951 his fledgling career was interrupted by Korea. He’d remained in the reserves and “got sucked into Korea.” Returning in 1953, John lost no time getting back to film work. 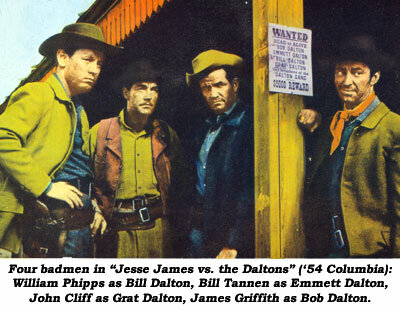 Becoming established, the parts got better in westerns with Tim Holt, Dale Robertson, John Payne, Scott Brady and others, as well as on TV’s “Cheyenne”, “Superman”, “Perry Mason”, “Wyatt Earp”, “Maverick”, “Twilight Zone” and dozens more. 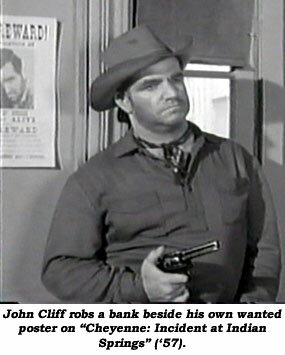 Retiring from acting after a bit in a 1972 “Kung Fu”, John relocated to northern California and went into real estate. Retiring from real estate in 1986, he spent his time traveling and golfing. He was honored at western film festivals in Sonora, California, and Charlotte, North Carolina, in his later years. A very warm-hearted heavy died at 82 of cancer (which he’d battled hard for 3 years) May 12, 2001, in Hayward, California.